Early on in life, Board Certified plastic surgeon Dr. Gary Motkyie developed a strong interest in the functioning and aesthetics of the human body. He began his career as a personal trainer and fitness competitor, where he learned the importance of good nutrition and the healing power of effective dietary supplements. Although he has transitioned into the cosmetic surgery field, Dr. Motkyie continues to practice a multi-faceted treatment philosophy that simultaneously addresses his patients’ beauty, health, and wellness needs. Dr. Motykie believes that “medical aesthetic treatments should be about improving a patient’s overall health and beauty from the inside-out.” He has pioneered an innovative, holistic approach to aesthetic enhancement that features cutting-edge cosmetic procedures performed in conjunction with complementary Health & Wellness services, thereby helping his patients to look and feel their very best. A key element to this integrative approach is proper supplementation. Most people are lacking essential nutrients in their diet, which is why Dr. Motykie created the Body By Motykie supplement line. Body By Motykie supplements take the guesswork out of purchasing supplements—all of our products are safe, meet label claims, and our superior manufacturer (Douglas Laboratories) tests all raw materials and finished products for the presence of contaminants such as heavy metals, molds, pesticides, and yeast. Each supplement has been specifically designed and developed by Dr. Motykie, who spent years conducting extensive research and testing to find supplements that were proven to promote healthy skin, delay the visible signs of aging, increase energy, and improve cognitive functioning. He also created pre- and post-operative supplements to support excellent treatment outcomes while expediting the healing process, allowing his patients to resume their busy schedules as quickly as possible after surgery. Many of the Body By Motykie supplements provide immune system support—this is crucial during the post-operative recovery period, as the body’s immune system is often under tremendous strain during this time. Unlike many “wellness” products on the market, Body By Motykie supplements contain only the highest quality ingredients and are NOT formulated with yeast, gluten, wheat, soy, milk/dairy (except for the probiotic), corn, sodium, sugar, starch, artificial preservatives/coloring/flavoring, or GMOs (genetically modified ingredients). For your convenience, Body By Motykie supplements may be purchased either online or at Dr. Motykie’s Medical Spa facility in West Hollywood, California. Patients should review all medications, vitamins and herbs with Dr. Motykie for any potential interactions or contraindications, as some supplements may need to be discontinued prior to surgery. 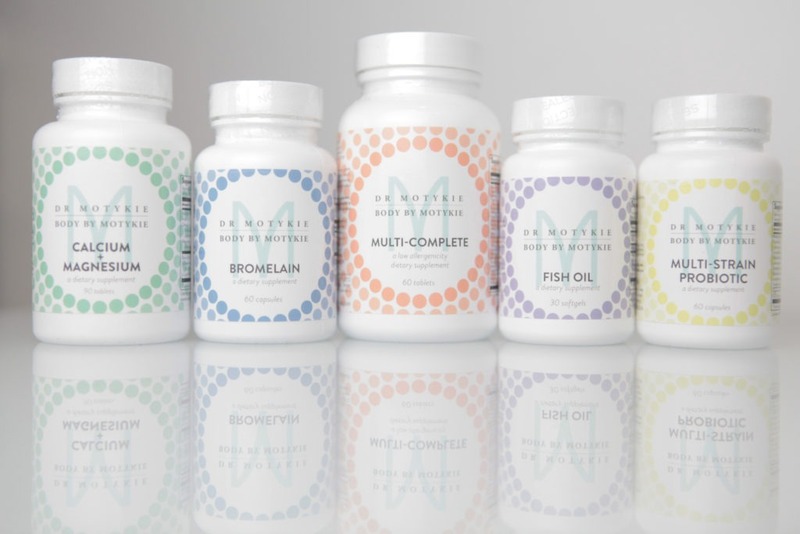 If you would like additional information about the Body By Motykie supplement line, or any of our cosmetic enhancement or Wellness Services, please contact the Motykie Medical Spa office today. We look forward to scheduling your initial appointment with Dr. Motykie and getting you started on the path to optimal health! FDA Disclaimer: the statements in the following pages have not been evaluated by the Food and Drug Administration. These products are not intended to treat, diagnose, prevent, or cure any disease.